With the onset of Winter and the darkening skies, or weekly trail running and dinner nights have fallen to the wayside. So instead we've decided to start up a Saturday Morning Brunch and Run! 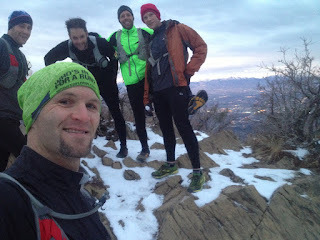 The first one was documented back in my Turkey Leg entry, the next was the View Benchmark, and then on Saturday - I again went with the Wasatch Mountain Wranglers (WMW) on my first REAL 'Peak Bagging' adventure up Grandeur Peak in the Wasatch Mountains just east of Salt Lake City. That's a brutal climb! It took me an hour and a half to get up there, I was the last one to the top! 7:30 AM, can you tell? 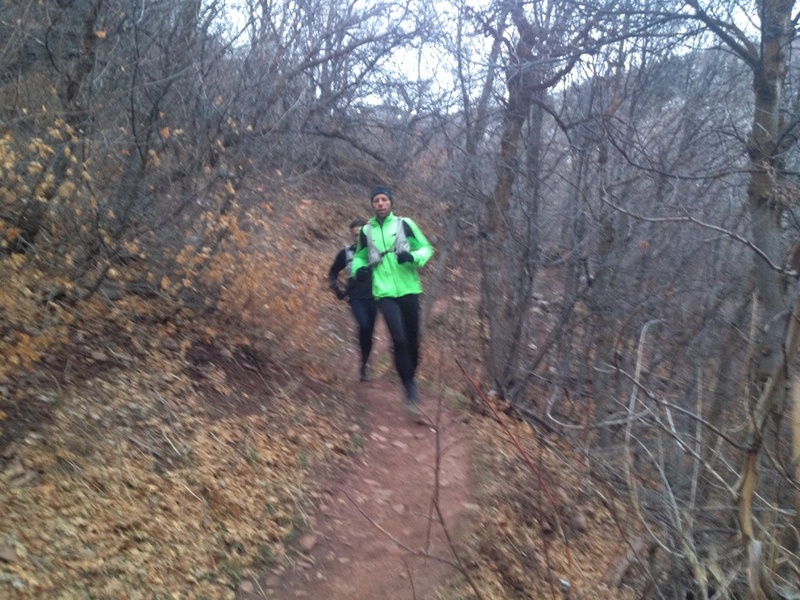 We started running down the Church Fork trail - Wow what a fun trail! 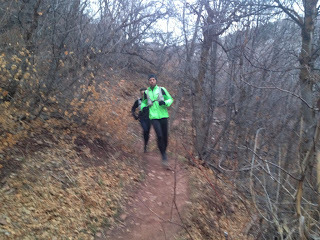 Next thing I new it, we'd reached the bottom of Church fork in Millcreek Canyon - 5 miles in. That 3 miles took about a half hour, but went by very quick. Next we ran along the Millcreek pipeline trail, looking down over some cub scout camps I attended as a kid, and BOY was I tired. My legs were still moving though, and I really felt pretty good until we headed uphill again at about mile 7. I felt like a slug! Then we hit another steep downhill for a bit, a thousand feet in a bit over a half mile, which was a lot of fun and ran around some trails and dirt roads until we made it back down to the parking lot. Grandeur is right above the middle of my head - I was up there?! Here it is from a different angle on the Freeway. Total distance, about 9.4 miles. For some reason Runkeeper shows the right paces and times on the map, but the total says 11.2. Maybe it's adjusting for difficulty! HA! I feel like I can improve on the uphill, but I felt pretty good overall about the run. Not too sore, not too beat up - oh yeah! Unfortunately that changed pretty quick - as my achilles tendon on my left leg flared up the next morning and my legs were SORE. Could barely walk!! Late Monday I'd slept a lot, and my Achilles had loosened up a bit, but my calves were still super sore. Because of the sickness I skipped BJJ to make sure I didn't get anybody else sick - but I sure would have liked to go! I feel stagnant having 2 days (not including Sunday - I don't normally do much that day) of nothing. I mean I did stretch and foam roll and try out one deadlift of about 215 lbs... but still. Like a slug. Hopefully I can change that tomorrow and the rest of the week. My calves are still sore, as are my quads, but that just means I need to go loosen them up, right? It has been great to get out on some more challenging runs with my brother and his crew of crazy ultra marathon trail runners. You can check out more of their adventures over at Refuse2Quit! It was great to bag my first real peak! I look forward to a few more!